How will Innovation Save P&G? Fintech Evolves, and this Blog Does too. Pooling Robotic Knowledge. IOT too? Is Small Data more Business Process Context? More engagement with Virtual Reality . Will this drive the acceptance of VR as interface? You can’t buy the world a Coke, but maybe you could see the world in virtual reality while you sip your Coke. ... That seems to be the idea behind the new designs Coca-Cola KO 0.12% just released that would turn some of the company’s cardboard packaging into foldable, origami-style virtual reality glasses for smartphones. ... "
Happened to be at a presentation announcing the launch of Internet 2, and admit I have not thought about it for years. Not really an advanced internet, but an alternate one. We used it to link to University research in early 'big data' analytics efforts. . Still around and being useful, primarily at Universities. Now at age 20. Suggesting that parked cars, acting as a network of computing systems and sensors, could play an infrastructure role as part of the Internet of Things. Why parked? Apparently cars spend 95% of their time parked, so thats where the resource is. An element of the smarter city? More details. We were proponents of using a 'consumer value equation'. Still relevant, but it has been suggested that there are value drivers that are evolving more rapidly than just cost and need to be tracked. And are likely disruptive. In the CPG Food industry.
" ... The report focuses on the rise of “Evolving value drivers” in consumer food purchases. Can you explain what those value drivers are and why they are on the rise? Jack Ringquist: Our study shows a pervasive shift in consumer preferences and shopping behavior. Roughly half of surveyed consumers say their purchase decisions are significantly influenced by “Evolving” drivers in addition to the “Traditional” drivers of Taste, Price and Convenience. ... "
In theVerge: Good to see more specifications for developers, also for innovators considering applications but still no much new with regard to realistic commercial applications beyond NASA and product design. Where are the enterprise applications? Correspondent Jason Maughan of PurePredictive sends along a Beta of some work he is doing on feature engineering. Based on Kaggle experience. As I have always said here, feature selection and engineering is a key part of any data science project. This is another case of where some aspects of this kind of analytic model can be automated. Giving this a try. A superhuman capability? Certainly in volume of recollection. Applications? Retail product location? Advertising analysis when linked to neural or behavioral clues? Today, that changes thanks to the work of Tobias Weyand, a computer vision specialist at Google, and a couple of pals. These guys have trained a deep-learning machine to work out the location of almost any photo using only the pixels it contains. Their new machine significantly outperforms humans and can even use a clever trick to determine the location of indoor images and pictures of specific things such as pets, food, and so on that have no location cues. ... "
At the link you can try your hand at this with an online version. In the Enquirer: I worked in the innovation space there for a number of years. Good article on what's up publicly, mostly in product as opposed to operational innovation. Nothing very surprising, but worth it for CPG and P&G watchers.
" ... has open-sourced OneOps, a cross-cloud deployment and orchestration platform. OneOps abstracts away the differences between cloud platforms and provides the tools to provision, manage and orchestrate applications. Applications developed on top of OneOps can be moved between clouds to avoid vendor lock-in or take advantage of differences in pricing or performance. Applications can also be distributed across multiple clouds to help improve resilience, to adapt to and handle large spikes in workload, or for disaster recovery and mitigation scenarios. Enterprises transitioning to a public cloud from on-premise infrastructure can take advantage of OneOps to operate in hybrid mode and maintain independence from any particular cloud provider. ... "
Now that we finally have a large number of potential interactive components for the smart home, how will they work together? CNET discovers, as I have, that the result is considerable fragmentation. Amazon Echo can form a part of the control structure, but does not solve the problem. Just where is this going? Around 2000 we started to demonstrate the future home concept, and quickly saw the issue occuring. I just noticed that the term Fintech had never been used in this blog before this year. So is it that a new term? I have just updated the text tags for Fintech to point to related articles. Which points to another way to explore this blog. You can search for words or phrases in quotes, at the upper left of the blog. Or you can search by tag at the bottom of each post. Most posts have been tagged. I frequently update tags. Such as the newly discovered Fintech. without indicating the update. If I update the body of a blog I will usually indicate the update with an edit. Links may go out of date, and I will update them when discovered. Meanwhile I see that Fintech has been used since at least the 90's, at first as the name of a group, and continues to evolve. Newly discovered, the Financial Revolutionist weekly newsletter on Fintech. I admit even the term Fintech (Financial Technology). Was new to me. Nicely done pieces to date. By Wescott Capital.
" ... Parents don't take diapers lightly. Amazon discovered this about a year ago when it discontinued its line of private label diapers amid complaints of poor quality by consumers. The diapers, released under the Amazon Elements moniker, only stayed on the market a little over a month. But a report by ReCode indicated that the e-tailer may be back in the diaper game with a slightly different strategy. Amazon, according to the report, has been contacting users with a market research survey about a brand called "Mama Bear" diapers. The survey solicited reactions to "Mama Bear" diapers' branding. It asked if the branding evokes a "high quality product" and if the survey recipient would have an interest in purchasing the diapers. .. "
From Maria Aretoula Dialog Connection. Voice Recognition application, Speech IVR, Voice User Interface (VUI), Design, Testing, Tuning and Optimisation. ... "
Via O'Reilly some interesting technical aspects of Python programming. An introductory tutorial, On Fluid code. and more videos. Still buy them both, but moving towards eBooks. Even my public library provides them. Bit I like the feel of the physical book, and its at a glance browse-ability. Not search-ability. The usual distinction between fiction and non fiction. Sometimes. More in Mashable. GE and Accenture are developing technology and analytics applications that help companies across a range of industries take advantage of the massive amounts of industrial-strength big data generated through their business operations. The two companies will jointly develop and market new technology services and pre-packaged solutions that can substantially impact efficiency and productivity. .... "
From DSC, (URL Updated) Most of these are well known examples, you should always think of readily available, credible data to add to internal systems. These are a great place to start. Data mix-ins can have great value, especially when creating interactive visualizations that provide information context. Contrary to what is said though, there is still useful external data you will have to pay for.
" ... In 2014, I started a project called RoboBrain at Cornell University along with PhD students Ashesh Jain and Ozan Sener. We now have collaborators at Stanford and Brown. What we’re working on is a way of sharing information that allows robots to gather whatever knowledge they need for a task (see “Robots That Teach Each Other”). If one robot learns, then the knowledge is propagated to all the robots. RoboBrain achieves this by gathering the knowledge from a variety of sources. The system stores multiple kinds of information, including symbols, natural language, visual or shape features, haptic properties, and motions. ... "
In K@W: On dynamic pricing. Seeing more of it, and as we gather more data it is possible to adjust to need or focus. The analytics are here. " ... The Promise — and Perils — of Dynamic Pricing ... "
Out of MIT. I recall this problem being posed in a conference, and its possible application to other more industrial problems. Rare events, but ones that can be well defined by their data context. And that context data is now continually gathered. In CWorld. And a technical background paper. Key here is addressing rare events, often forgotten in a frequentist statistical world.
' ... "Our goal was to inject data into our businesses as fast as possible to be able to see new opportunities," says Bryson Koehler, executive vice president, CTO and CIO of The Weather Company. "It's not realistic for a business to go dark on a project for any extended period of time just to clean up data. So much changes on a daily basis -- so many new sources of data -- that that journey would never be complete." In Fast Codesign; A radical bet, looking at disabled communities. Very interesting history of the concept that has led to a number of design innovations. So not really that radical at all. We encourage those who join the calls to add questions and comments to the https://www.linkedin.com/groups/Cognitive-Systems-Institute-6729452on LinkedIn and we ask that you ask questions at the end of the call.xpressive TTS .... "
This direction makes sense, have not looked at the details yet. In TechRepublic: Towards more human Watson APIs . That's good " .... IBM Watson, Big Blue's cognitive computing division, announced Tuesday that it was expanding the availability of Watson APIs with three new tools: Tone Analyzer, Emotion Analysis, and Visual Recognition. IBM Watson is also updating their Text to Speech (TTS) feature and rebranding it as Expressive TTS .... "
In K@W: Some useful, perhaps obvious thoughts here. As I always say, stay closer to the business.
" .... Many businesses will say that their customers are their most valuable assets, but few understand how true that is — or how accurately a measurement of customer-based value can price their whole enterprise. In their new paper, “Valuing Subscription-based Businesses Using Publicly Disclosed Customer Data,” Wharton marketing professor Peter Fader and Wharton doctoral candidate Daniel McCarthy, along with professor Bruce Hardie of the London Business School, successfully built a model that allowed them to do just that — with formulas that concretely link the value of a business’s customers to the overall value of the firm. Fader and McCarthy recently spoke with Knowledge@Wharton about how their work can help corporate finance folks and retail investors alike, why they are making their models public, and why all customers are most decidedly not created equal. .... "
In WCPO: Would think there would be more opportunities to make smaller footprint urban stores more profitable with smart interactions with the consumer. To build these complete end-to-end electrical power systems, GE Aviation created advanced manufacturing, simulation and physical integration facilities in Dayton, Ohio, and Cheltenham, England. The two virtually linked locations can design and test an entire aircraft electrical power generation and distribution system in the lab before it ever reaches the OEM’s factory floor. ... "
Very interesting stories, facts, statistics and technologies feeding the aircraft systems of the future. I am following the widening thread here here. Recall my mention of our work in this area, see the tag below. Don't know exactly what analytics are being done here, but can guess. Opportunities for true optimization here. Where are the auctions? In Adage: " .... NBC Universal Takes First Steps To Sell TV Programmatically ... Linear Inventory Will Be Available In Private Exchanges ... "
Nicely done, and for the method I often give for driving value in analytics, bring your business reasoning closer to the analytics. Its the business that is of most importance. Everywhere you go these days, you hear about deep learning’s impressive advancements. New deep learning libraries, tools, and products get announced on a regular basis, making the average data scientist feel like they’re missing out if they don’t hop on the deep learning bandwagon. However, as Kamil Bartocha put it in his post The Inconvenient Truth About Data Science, 95% of tasks do not require deep learning. This is obviously a made up number, but it’s probably an accurate representation of the everyday reality of many data scientists. This post discusses an often-overlooked area of study that is of much higher relevance to most data scientists than deep learning: causality. .... "
See also this recent book. Why: A Guide to Finding and Using Causes by Samantha Kleinberg.
" ... Our Nokia AVA cognitive services platform delivers today’s services quickly and flawlessly. It also helps you prepare for the Internet of Things when near 100% availability will be essential to manage the multitude of connected applications. The platform supports our Care services (including Predictive Care), Optimization services (including Predictive Optimization), Network implementation and Managed services. Available today are services for Nokia Care and multi-vendor Predictive Optimization, while other services will follow shortly. .... "
An area we examined as well, long before the era of mobile Apps. In Adage: " ... How J&J Research Led From Bath-Time to a Mobile Sleep App -- and More Products in Carts ... Global Campaign Includes Original Lullabies ... "
" ... At Clareo our mission is to help businesses adapt and grow. We help leaders adapt their businesses and create new ways to grow in rapidly changing markets. Together, we build the plans and capabilities that deliver results. We assist clients in improving strategy execution, finding radical efficiency gains, developing entrepreneurial capabilities, taking new ideas to market, exploring plausible futures, and investing in business ecosystems. Our clients choose Clareo when they want bold new ideas fueled by a network of leading global experts. Working alongside our clients, we create compelling strategies that lead to action. .... "
In CWorld: What appears to be a plus for Apple in the enterprise. " ... IBM calls the move a “key next step in IBM and Apple’s shared journey to help enterprises advance their mobile strategy with innovative app design, analytics, process transformation and integration required for a mobile first experience.” .. " More on Swift.
" ... Technology-driven trends will revolutionize how industry players respond to changing consumer behavior, develop partnerships, and drive transformational change. Today’s economies are dramatically changing, triggered by development in emerging markets, the accelerated rise of new technologies, sustainability policies, and changing consumer preferences around ownership. Digitization, increasing automation, and new business models have revolutionized other industries, and automotive will be no exception. These forces are giving rise to four disruptive technology-driven trends in the automotive sector: diverse mobility, autonomous driving, electrification, and connectivity. ... "
Too little considered, how do you actually do strategy? Are You A Six Dimensional Strategist? In a recent post ‘For Business At Warp Speed, Is Customer Strategy The Only Strategy?’, (Link) we touched upon how in the world of relentless market volatility, customer strategy takes center stage. Traditional strategic models and planning exercises have limited impact and the essence of strategy today is about continuously finding ways to provide value to customers. The traditionally inside-out approach to business strategy needs to be replaced by an outside-in approach, and long-term strategic planning and execution needs to be redefined with a focus on agile planning and execution. ... "
A favorite topic of mine, and I believe the most important introductory aspect of analytic modeling. Here in DSC. It is very important to get feature selection right. Both in what you include, and what you leave out. In particular this article does a very good job in showing how the selection of features is influenced by your goals in modeling, and how your models can be made more predictive by engineering your variables. This links model goals and business needs, always a good idea. In DSC: " ... Feature selection is one of the core topics in machine learning. In statistical science, it is called variable reduction or selection. ... Here, we mention an article published by Isabelle Guyon and Andre Elisseeff in Journal of Machine Learning Research. While published in 2003, it is still one of the best ML papers on feature selection. Nicely done piece about the need for predictive analytics. IBM sponsored. By PredictionImpact. You may need to register. Good statistics and thoughts. I like that fact that this is NOT about big data or machine learning or Cognitive. Those are just tools to an end. The end is to make better decisions. Faster, cheaper, more profitable .... better. Was pointed via this piece in CSI. Fascinating piece I was reminded of. Doug Engelbart on a framework for human augmentation. We looked at this, but could not translate it into reality. Can it be done now? More on Engelbart interactions at the tag below. On the role of the futurist in retail and grocery. A role I played in the innovation center when we looked for new ideas to test. The simplest form of data visualization. Scatter plots. Sounds obvious, but understanding how people react to many, many variable problems can be important. Note the term Scagnostics: or Scatterplot Diagnostics. Not used that often, but worth understanding. Capabilities exist in R.
In Scientific Computing: " ... Members of Tandon’s data-visualization group, headed by Professor Enrico Bertini, have conducted a study that found that results obtained through algorithmic methods, such as those known as scagnostics, do not necessarily correlate well to human perceptional judgments when asked to group scatter plots based on their similarity. While the team identified several factors that drive such perceptual judgments, they assert that further work is needed to develop perceptually balanced measures for analyzing large sets of plots, in order to better guide researchers in such fields as medicine, aerospace and finance, who are regularly confronted with high-dimensional data. ... "
Always interested in the difference between very specific infrastructure design and how it evolves based on use and need. Here an example where cities may need to evolve very quickly. In the Verge. How about remote warehouse inventory checking? Security? Recalls an idea we had long ago. 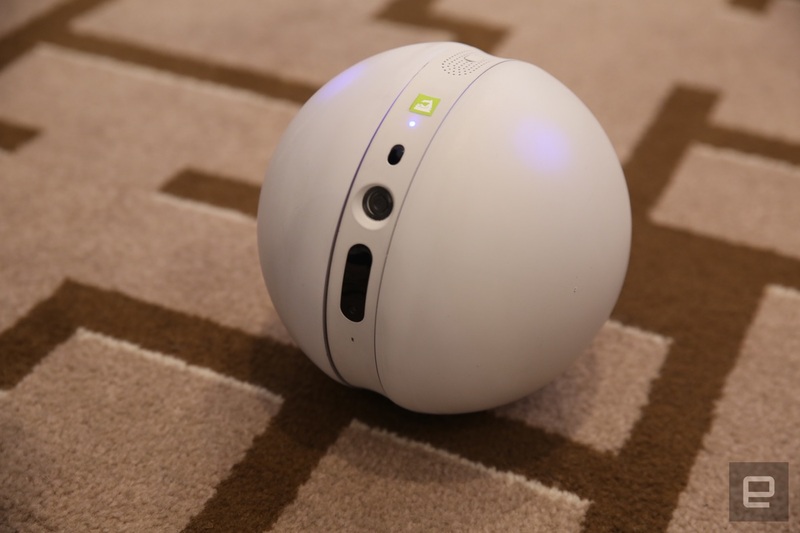 In Engadget: " ... Then this is where things get really weird, LG caught everyone by surprise by announcing "Rolling Bot" a Sphereo-style remote controlled, well, ball that has a camera and, of course, a laser. It appears to be part useful (you can remotely view your house with your phone like a mobile security camera) and part "wtf" (it's a fancy pants cat toy). We're less sure on this one, but points to LG for trying something different. ... "
Update, from CNet, more data and video. Makes sense. TV as a hub? Historically TVs have long durability? Is that still the case? Its intelligence in the cloud? With what other standards? In CNet: Samsung to add new Smart TVs to its Internet of Things platform, SmartThings ... All of Samsung's SmartTVs and SUHD TVs for 2016 will be compatible with the company's Internet of Things ... "
Nicely done examples with R and Python code. by Sunil Ray. Does not cover the fundamental statistical considerations that determine the correctness or application of patterns you find, but is still operationally useful. So if you already know the stats, this shows you how machine learning is done in R or Python. Details at the link. I would like to see some less obvious applications of cognitive. Beyond just clever search, Creativity. Innovation. Deeper learning. Interaction with buried enterprise data, linking that to public data, or creating needed data from sensors. Demanding needed data. Designing the experiments. Ideas will be evaluated by a panel of expert judges for technical validity and ultimately, the TED and XPRIZE communities will choose the winner based on the audacity of their mission and the awe-inspiring nature of the teams’ TED Talks in 2020. .... "
In McKinsey: The benefits match those of earlier technology cycles, but companies must scale up their data-analytics skills to reap the gains. ... " . Scaling skills yes, but also targeting to real business problems and data. Correspondent Andrew Pitts sends along some examples using his startup Polinode. Much more at the link. He is doing lots in the HR analysis area, But the approach is widely applicable. The same network as the above but a particular view into that network - community structure is calculated and nodes colored by community and nodes are sized by pagerank. This is a classic example network in the network analysis space - it is the co-occurrence of characters in the novel Les Miserables. I have captured a view where I have sized by degree and colored by community) ... "
The APQC collection of documents on knowledge management. See also Ken Hayman's short piece on the subject, Reexamining. How in particular does AI connect to this?
" ... Marcus has a very different perspective from many of the computer scientists and mathematicians now at the forefront of artificial intelligence. He has spent decades studying the way the human mind works and how children learn new skills such as language and musicality. This has led him to believe that if researchers want to create truly sophisticated artificial intelligence—something that readily learns about the world—they must take cues from the way toddlers pick up new concepts and generalize. And that’s one of the big inspirations for his new company, which he’s running while on a year’s leave from NYU. With its radical approach to machine learning, Geometric Intelligence aims to create algorithms for use in an AI that can learn in new and better ways. .... Is deep learning based on a model that’s too simple? Marcus thinks computer scientists are missing a huge opportunity by ignoring many subtleties of the human mind. ... "
The successful user experience is about meeting a consumer’s need on an individual level – a “segment of one” not “one-size-fits” all, many experts say. But what does that look like in practice? “What really differentiates companies is their personalization through data — which allows them to build unique experiences that lead to increased engagement and better outcomes, …” write Scott A. Snyder, president and CSO of Mobiquity and a senior fellow at Wharton, and Jason Hreha, founder of Dopamine, a behavior design firm, in this opinion piece. Yet even with this determined focus on design, most digital experiences fall short of user expectations. Of the 700 million websites that exist, 72% fail to consistently engage users or drive conversions. Of the 1.6 million apps available, just 200 account for 70% of all usage, and three out of four apps aren’t even used beyond the initial download. ... "
Spent quite a bit of time looking at at the problem of recognizing and tagging images for marketing applications. It turned out to be a key requirement for systems that deal with asset and engagement management. So this announcement of advanced image tagging beta capability was fascinating. A Beta for developers. If I embed this in a system I have to rely on Google continuing to improve and support it. Looking forward to a deeper examination.
" ... In addition to making the service publicly available, Google also revealed the pricing. Developers will be able to run up to 1,000 images through Google services for free, and then pay a flat fee for each group of 1,000 images they upload after that. Developers will get discounts for sending large volumes of pictures through the service. However, users will be able to send a maximum of 20 million images a month through Google Cloud Vision during the open beta period, so companies with large-scale production workloads will likely want to reserve its use for low-volume applications. ... "
February 18, 2016 by Laura Winig. GE has bet big on the Industrial Internet — the convergence of industrial machines, data, and the Internet. The company is putting sensors on gas turbines, jet engines, and other machines; connecting them to the cloud; and analyzing the resulting flow of data. The goal: identify ways to improve machine productivity and reliability. This MIT Sloan Management Review case study looks at how this traditional manufacturer is remaking itself into a modern digital business. ... "
Available as a free download for a limited time. So whats a security graph? " ... Data visualization is a booming segment of the big data job market, and it’s found an obvious foothold in security. The requirement of data visualization in job descriptions has increased in big data jobs by 12 percent in just the first half of 2015, which may indicate the skill is in the early stages of demand. As more companies begin to realize their need for quick digestions of large volumes of data to find trends, especially in security, the demand for visualization will likely keep increasing, vague as the description may be ... "
The topic of Mind Palaces have come up often as plot points on memory problem oriented TV programs. Could you have ever guessed there were many of these? How can a human effectively remember large volumes of data? The approach of 'memory' or 'mind' Palace uses visualization to tag memory items in a physical place to make it easier to remember. More on Mind Palaces. Could this be implemented via a supporting user interface? Has this been tried? To accommodate the development and support of smart devices, companies will need to update existing IT architectures and operating models. Here’s a potential road map. .... "
Probably will see more bots that watch what we say. Or the streamed data we need to pay attention to. Or engage us in conversation. Just started using Slack and I can see how that would work.
" .... The New York Times built a Slack bot to help decide which stories to post to social media ... The bot, named Blossom, helps predict how stories will do on social and also suggests which stories editors should promote. .... "
In Retailwire: This is possible, if all the architecture is there. It can also add the augmentation to where it should be, in the aisle. Fast Company's "The World's 50 Most Innovative Companies 2016"
For leading the Industrial Internet of Things. Check out the full award details here. Via IBM: for IBM resources. Use this educator guide for step-by-step guidance through recommended tutorials, labs, and other resources to teach others how to expand upon their Internet of Things skills. Understand the importance of developing skills around the IBM Internet of Things platform. Obtain a basic understanding of IBM’s Internet of Things Foundation on Bluemix. Find classroom assets, labs, training and other resources to use in your classroom. .... "
In Wired: By this measure, its not here yet. Yet if we choose carefully, it can be remarkable.
" .... You might say that, way back in 2011, IBM Watson beat the best humans on Earth at Jeopardy!, the venerable TV trivia game show. And it did. Google just built a system that could top a professional at the ancient game of Go. But for a machine, these are somewhat easier tasks than taking a science test. “Jeopardy! is [about] finding a single fact, while I would imagine—and hope—that 8th-grade science asks students to solve problems that require several steps, and combine multiple facts to show understanding,” says Chris Nicholson, CEO and founder of AI startup Skymind. The Allen Institute’s science test includes more than just trivia. It asks that machines understand basic ideas, serving up not only questions like “Which part of the eye does light hit first?” but more complex questions that revolve around concepts like evolutionary adaptation. “Some types of fish live most of their adult lives in salt water but lay their eggs in freshwater,” one question read. “The ability of these fish to survive in these different environments is an example of [what]?” ... "
In IEEE Spectrum: Sure, we will do it, and are doing it, if only for their capability of getting attention. But will there be actual value in mimicking ourselves? Or danger? Reminds me of the 'Media Equation', which we aimed to use to create engagement. Now new Chatbots are here again, looking for human leverage. And imagine the hyperledger linked to the smart contract. A new kind of compliance measure?
" .... Most people know alternative currencies such as bitcoin make use of a distributed transaction ledger technology called blockchain. But what isn’t well-known is how numerous businesses are investing heavily in blockchains for noncurrency applications. In other words: stupid people + superintelligent machines —> superstupidity. ... "
In Think with Google: Interesting stats and learnings about the use of video in Ads. An area we looked at closely. Google obviously has an interest regarding Youtube. Our interest was in cart mounted videos. How does this differ if you use it in-store? " ... Online video can be much more than an awareness driver. New research shows that YouTube not only drives brand metrics throughout the consumer journey—from consideration and favorability to purchase intent—but also boosts potential for positive return on ad spend compared to TV. ... "
In Retailwire: We can hardly do it consistently yet, but we can get some indications of mood and possibilities. And we don't have to always be exactly right. This particular application seems a gimmick.
" ... PCWorld reports that Uniqlo's UMood system analyzes a customer's brainwaves through the use of an EEG headset the customer wears. The system displays a selection of images in order to gauge the customer's neuro-electric responses to each and then uses that information to determine the customer's mood. The customer is then shown one of the store's 600 shirt designs, each tagged as evoking a particular mood. Uniqlo's hope is that the match between the brainwave reading and the mood the shirt evokes will result in a sale. Uniqlo debuted UMood in one store in Sydney, Australia, and will be implementing it in other stores in that area over the next few weeks. ... "
Making my way through the book below. Martin Lindstrom is a great storyteller, starting with his well known work with LEGO. Before I finish the book, my initial impression is that there is real value here. It can be seen as making sure you include as much real business context in your problem as possible. In my usual world this means including it in your data science, but it can also mean starting with business process analysis, and adding the deep analysis. Is that Small Data? Simple insight? As long as it produces value, that is good. And getting the business decision makers included, and valued, as soon as possible is a way to get your method understood and delivered. Will have more on this as I proceed. Worth a read. Thoughts? ... Former colleague Martin Lindstrom has a new book out: Small Data: The Tiny Clues That Uncover Huge Trends . ..... Take a look at their pre publicity. Yes, well known, but often ignored, is all the context in the model? Again in the realm of misusing statistics. A lengthy conversation with Richard Nisbett. A crusade, he says, that may be worth taking note of.
" .... The thing I’m most interested in right now has become a kind of crusade against correlational statistical analysis—in particular, what’s called multiple regression analysis. Say you want to find out whether taking Vitamin E is associated with lower prostate cancer risk. You look at the correlational evidence and indeed it turns out that men who take Vitamin E have lower risk for prostate cancer. Then someone says, "Well, let’s see if we do the actual experiment, what happens." And what happens when you do the experiment is that Vitamin E contributes to the likelihood of prostate cancer. How could there be differences? These happen a lot. The correlational—the observational—evidence tells you one thing, the experimental evidence tells you something completely different. ... "
Good piece. Though I retain my opinion that the accuracy and ability to interact with the data is more important. Your story still has to first be an accurate one, not just a narrative you would like to have the data support. ... And include the tale of why it is of value. 5 Tips to yield the best return on this year's Big Data investment (and, they're not about technology)! ... "
In the National Geographic: Interview with Alberto Cairo. Interesting thoughts, But I still believe in simplification, accuracy and interactivity the most. You can add art and tell a good story to attract people and maybe engage them. But will you unless you have the fundamentals? Good overview. We used these methods before they were well understood. Modern coding makes this much easier to do, and even to adapt as your data changes. In Python or R. Consider automating the method to tune your results to changing data. Or to changes in targeted process. Some interesting thoughts, though speculations, embedded in this article. Makes sense for Amazon to test, control and optimize larger parts of its supply chain. Watching this. Is Aerosmith the name of Amazon's trial run in the air cargo business? And is that delivery service being tested in Cincinnati's backyard? Those are good questions that nobody's answering, although new hints of confirmation were dropped this week. In recent months, analysts and other Amazon watchers have increasingly speculated that the e-retailer is testing such as delivery service of its own, instead of shipping through companies such as UPS or FedEx. In recent months, analysts and other Amazon watchers have increasingly speculated that the e-retailer is testing such as delivery service of its own, instead of shipping through companies such as UPS or FedEx. ... "
In Gartner Blog: Completely agree. And I will take the argument a step further. Simplicity should also guide your ordering of methods under consideration. Keep it simple, visual, ordered and rational. With the agility to back out. In the BBC: Supply chain and travel in a low pressure pipe at up to 1000 Km/Hr? All it may need is some infrastructure. In process. Good piece. Amassing inventory from thousands of merchants around the world. Dragon Boat. A huge planned global supply chain move by Amazon could disrupt product access, sharply lower Amazon's costs and accelerate product delivery to shoppers. .... "
Late to this, but I note that the Storeflix site has been updated, with some new directions. Image based in-store analysis. Less emphasis on compliance. Some mention of analytics being driven, but no details at the site. Did a bit of work with them. I like the idea of connecting easily acquired images to retail intelligence. See also, their blog.
" .... created the first real-time visual collaboration technology for CPG companies to optimize retail execution using smart phones and tablets. Kroger is using the StoreFlix technology now to manage retail merchandising conditions. .. "
This is where we come into the picture – and you get the visual insight and control you deserve. .... "
In FastCoCreate: Superbowl ads promote science and science process.
" ... What: GE Theater presents a series of digital short films using science to challenge a few longstanding expressions of impossibility. Why We Care: The brand follows up its hit podcast The Message by extending its "GE Theater" banner to include more fun, science and innovation-inspired content that aren't overly branded yet tie into GE perfectly. ... "
Is it important to make AI more human? That was part of what we attempted in our 'big' idea. Have a piece of ad equity talk to you conversationally, and you can engage them. Did not work then, but technology has improved. Is being clever better than being smart? A key intelligence module of the re-emergent chatbot. In CACM: The power of chitchat.
" ... Machine-generated data returned to the agenda last week after industrial heavyweight PTC Inc. and ServiceMax Inc. combined forces to give organizations much-needed visibility into the growing number of connected devices finding use throughout their operations. The duo is kicking off the effort with the introduction of a jointly-created tool that enables technicians to monitor for signs of equipment deterioration via the latter’s industrial automation platform. The aptly-named Connected Field Service displays error warnings from malfunctioning hardware in real-time along with a wealth of diagnostic information that is meant to simplify troubleshooting. Most of the work involved in handling the data is carried out by PTC’s device automation platform, ThingWorx, one of the more popular options for manufacturers seeking to tap the sensory output of their gear. The software is complemented by an analytics toolkit that makes it possible to scan the raw telemetry for insights using machine learning, which became a central talking point in its own right last week thanks a new open-source contribution from Yahoo Inc’s research division. ... "
" ... In order to help sports fans get started, IBM uploaded a slew of offensive statistics from the 2014 NFL season (provided by SportsData LLC) into its database. For instructions and a demo of what you can do with NFL stats in Watson Analytics, visit the Watson Analytics Storybook. From there, fans can explore data visualizations of how certain trends played out during the season — like a weekly breakdown of interceptions thrown by the home and visiting teams — and even ask the system predictive questions like, "Which factors lead to rushing touchdowns?" .... "
Michael J. North, MBA, Ph.D.
Talk today by Tom Davenport: In particular how can we look at the current influence of cognitive/AI in the workplace? ... “Beyond Automation: Smart Machines + Smart People”, where he talks about some of the material in his forthcoming book, which I will further review here. See also his HBR article " Beyond Automation". Slides here. Talk recording here. This software, Fluxicon Disco, was new to me. Described in KDNuggets. I recall doing something similar in R, but this appears to cover the whole realm of process flow modeling. Discovers a model from data, as opposed to BPM, which has you create the model.
" ... Process mining can analyze your process in a bottom-up fashion. You don't need to have a model of your process to analyze it — Process mining uses the history data in your IT systems. Your IT system already records all steps of your process in execution. With process mining, you get a process model from these data. This way, your real process, and actual business rules, can be discovered automatically. ... "
Of interest is the involvement of the CPG giant Unilever. A data source, likely linked to real time analytics. Crowdoscope – a breakthrough survey and discussion tool developed by Unilever and Silverman Research. Silverman Research today announced the release of Crowdoscope, an entirely new type of survey and discussion tool designed to obtain real-time social collective intelligence. Developed in partnership with Unilever, Crowdoscope is a self-organising visual environment that has been carefully designed to support group interaction and extract insight. .... "
Have been always intrigued by storytelling, establishing a narrative, as a powerful way to convince, to advertise, to market. It also a way to convert your analytics, your data, your trends, your discovered patterns into convincing arguments. Lots in the press today about that. But ... Its also a way to deceive. To introduce bias. Have seen that. That's why I prefer providing a user with an answer, plus the ability to interact with that answer. To test it in application. When people tell us stories we tend to let our guard down. We don’t think we’re being “sold” on something, so we tend to go along for the ride. We quietly lose motivation to detect lies. In Kognit (2014-2015), we enter the mixed reality realm for helping dementia patients. Dementia is a general term for a decline in mental ability severe enough to interfere with daily life. Memory loss is an example. Alzheimer's is the most common type of dementia. Mixed reality refers to the merging of real and virtual worlds to produce new episodic memory visualisations where physical and digital objects co-exist and interact in real-time. Cognitive models are approximations of a patient's mental abilities and limitations involving conscious mental activities (such as thinking, understanding, learning, and remembering). We are concerned with fundamental research in coupling artificial intelligence based situation awareness with augmented cognition for the patient. ... "
From the Cisco Blog: Some interesting thoughts on intelligence and an interview with Marvin Minsky. I like the comment about Minsky saying big business is stalling progress: But I don't recall him not willing to take the money of business. Sure there are different goals, challenges and methods. Governance is also very different. But we funded him and many AI enterprises of the time.
" ... As an inventor and engineer myself, I get it. Big business can get in the way of good science. But it doesn’t have to be that way. I joined Cisco because I felt that solving some of these very hard problems would be easiest from inside a company with both tremendous resources and a passion for innovation. Resources and passion for innovation are the key words. Three years later, my experience here proves that hypothesis right. We are using our resources and our commitment to solve some hard problems. Others are too; I am impressed by the real progress in Machine Intelligence made at the likes of Google and Facebook, Apple and even IBM. ... "
Had thought there was some opening for interesting deep learning based image understanding in Pinterest. To direct our online shopping? Will these systems be able to understand the subtleties of these images? Is the image then the thing? ... " ... Pinterest is about to launch an AI tool that will make online shopping a lot easier ... " . In RightRelevance. Recently experienced aspects of BYOD in the enterprise, so this is interesting. True you can now use your smart phone there, But do expect that the enterprise will reach into your devices to secure them in unexpected ways. For example, in my case automated backups were stopped. So the personal part of my smartphone was thus put in jeopardy. Ultimately I had to go to a two phone system. More in ArsTechnica. Seeing this directly and also through increasing queries about what to do next to play. Good overview. One of the reasons that gamification is hard to do is that good, engaging games are hard to develop. Thus expensive to create and test and adapt. This prevented us from adequately testing and delivering the idea. Announced today, the Beta AWS system Lumberyard Free, cross platform and open source. Can imagine this would have made the construction of such systems much easier. I can also see this as enabling some kinds of analytic systems where humans need to be integrated with algorithmic systems that drive the 'game'. Simulations and agent models come to mind. Does this provide the Cognitive engagement engine for these models? Ideas?
" ... Amazon Lumberyard is a free AAA game engine deeply integrated with AWS and Twitch – with full source. ... Amazon Lumberyard is a free, cross-platform, 3D game engine for you to create the highest-quality games, connect your games to the vast compute and storage of the AWS Cloud, and engage fans on Twitch. By starting game projects with Lumberyard, you can spend more of your time creating great gameplay and building communities of fans, and less time on the undifferentiated heavy lifting of building a game engine and managing server infrastructure. ... "
In the APQC Blog: Not unexpected view This is a survey to look at expectations. I would have further looked at expectations that technologies, like the internet of things, might influence the supply chain. In the midst of putting together a 'practical smart home'. We experimented with this idea at the innovation centers from 2000 on, and I demonstrated the idea to many people, but always with quite a bit of skepticism. Is the time now right? Is this the showplace of the IOT? Are there the right kinds of interconnectivity? The right kind of goals? In the CACM: on Thermostats.
" ... University of Southampton researchers have developed a prototype "smart" thermostat, which enables users to control their heating based on the price they want to pay rather than setting it by temperature alone. The researchers produced three different smart thermostats that automated heating based on users' preferences and real-time price variations. One of the thermostats enables users to explicitly specify how the heating should respond to price changes. The two other thermostats are learning-based models, which use artificial intelligence to automate the temperature settings based on learned household preferences. ... "
" ... Cognitive Systems Institute Group Speaker Series call this week, on Thursday, February 11, 2016 at 10:30 am ET (7:30 am PT). Our presenter on Thursday will be Tom Davenport, Distinguished Professor at Babson College and author, will be presenting: “Beyond Automation: Smart Machines + Smart People.” I hope you will join the call. We encourage those who join the calls to add questions and comments to the https://www.linkedin.com/groups/Cognitive-Systems-Institute-6729452 on LinkedIn and we ask that you ask questions at the end of the call. .... "
Visualization is a key way to understand your data. I believe it is the key first step to any analytics problem. Here a look at a number of tools, many of which I have not worked with. Worth knowing the landscape. Interesting view. Still think there is a big gap understanding the hardware, software and algorithms used by the brain. Yet this is a good first step, accurately knowing what happens in a given context. And learning is only a part of doing something. Google on how to videos, pitching YouTube, with as always, interesting stats. I remember the family using a 'how to tie a necktie' in the early days of the Web, left a lasting impression.
" ... For big projects and small fixes, people look for how-to videos on YouTube, increasingly on mobile. Of smartphone users, 91% turn to their devices for ideas while completing a task. See how brands like Home Depot and M·A·C are using mobile video to reach people in these 'I-want-to-do' micro-moments. ... "
L'Oreal USA looks to be the latest big marketer set to bring programmatic digital trading in house, soon after concluding its North American media review. See the programmatic ad buying tag below for much more. In CACM: Pointing to an article in New Scientist: " ... Google DeepMind just entered the 90s. Fresh off their success in playing the ancient game of Go, DeepMind’s latest artificial intelligence can navigate a 3D maze reminiscent of the 1993 shooter game Doom. .... "
In the BBC: Am particularly interested in how algorithms and workers interact. There has always been an interpretation of the results provided by computing, even close loop systems, like those in process control. What will this be like when the interaction looks more like a continuous, learning conversation? Some statistics about the re-emergence of AI in Business. As pioneers of the use of AI in business, we have also started to see many queries asking: Is this the time to restart our efforts here? Why, How, with whom? All still not have obvious answers, but it is time to think this through. Two additional angles are now essential: The inclusion of corporate data that links directly to decision making. And the use of Cognitive interaction with both customers and internal decision makers. Bring it on. By 2018, six billion connected devices will proactively ask for support. (Gartner) ..... (more) .... "
In InformationWeek: SAP Uses Super Bowl 50 To Test Data Visualization, UX ... SAP's Fan Energy Zone in San Francisco's Super Bowl 50 celebrations is a giant test case in how users create, share, and process data in real-time. .... "
Hidden Science Behind Superbowl Ads. Neuroscience? In Adage: Lots about behavioral science to understand top ads, but no mention of neuroscience. Consumer behavior is different than neural behavior. Recall that in past years I have mentioned some of the neuromarketing techniques used to analyze superbowl ads. (See the Superbowl link below) I even did secondary analysis of that data. Does this mean that neuromarketing is fading? Always want to see real commercial and industrial applications of augmented (now being called mixed reality) applications. Here the results of an App competition. Still a bit disappointing, more art than industry. What gets me to wear it, use it. Beyond the novelty? A new jet engine takes a certification flight. Article in GE's Bikeshop. My new experiences show how complex the development, delivery and use of a jet engines can be. New kinds of analytics and data management are essential. As they say, to get up in the air and to your destination, and safely down again. In Technology Review. Taking more hints from nature. Although I disagree that its a complete way to do computer programming. People still make sequential decision processes. ... A new $12 million dollar project at Carnegie Mellon University could make machine learning even more powerful by uncovering ways to teach computers more efficiently while using much less data. The five-year effort will use a newish technique, called 2-photon calcium imaging microscopy, to study the way visual information is processed in the brain. ... "
In the CACM: Revealing the API Ecosystem and Enterprise Strategy via Visual Analytics. Valuable insights can be gained by applying visual analytic techniques to understand complex, emerging ecosystem dynamics and evolving enterprise strategies. ... "
Interesting idea, but still too complex. Simple still works well. As retailers look ahead to the way consumers will shop in the next five to 10 years, it's likely they'll be using technologies like artificial intelligence and virtual reality to keep customers interested. Retail is no longer about having the latest products on the shelves in brick-and-mortar stores or having a cool website. It's becoming much more than that. Some retailers already are working to merge their in-store and online efforts, which provides more information about their customers, allows better customer service and the chance to sell more goods. ... "
The Digital Generation which will represent 75% of the workforce by 2025 is used to spending time on play-based activity. With an average age of 27 and an almost equal split between women and men, players are already working in your company. The play platform is no longer the console but the PC and the smartphone – both part of work environment. ... "
" ... Google sounds more and more like Twitter, heralding ways marketers can tap into live events for engagement. As such, the company on Wednesday rolled out a new ad product called Real-Time Ads at a press event in New York. With Real-Time Ads, Google aims to capitalize on the ripple effect of live events, such as sports events, political rallies or awards shows, along with all of the consumer and brand conversations that arise because of them. The format can be “dynamically inserted” across YouTube, “hundreds of thousands of apps” and about two million sites across the Google Display Network, according to Tara Walpert Levy, managing director of agency sales for Google. ... "
You can now order a Dominos Pizza verbally from your Amazon Echo. No, it won't print/bake it locally yet. The piece in TechCrunch correctly points out that for these add-on 'skills' you need to phrase your order in a specific, awkward way. So its not a 'buy button', that's easily remember-able. Hardly a way to promote impulse purchase, any retailer would tell you. So why can't I just say 'Need Pizza'? Echo needs to work on their natural language interpretation to have the Echo become a credible smart hub for the home. But it is the rare new technical device I have used every day since I bought it a year ago. So the exposure to a potential 'buy button' is there every day. Wall Street and Silicon Valley may be 2,562 miles apart, but at Penn, finance and tech are becoming increasingly intertwined. Eric Bradlow, a professor in the Marketing Department at the Wharton School, sees business strategy and technological competency, particularly in the way of data science, as inextricably linked skills for jobs in the modern economy. “People that can take statistical modeling and big data and turn it into corporate strategy — that’s what firms are looking for today,” he said. Bradlow cited recent changes that Wharton has made in its curriculum to keep up with the needs of the changing job market. Wharton re-named its Operations and Information Management Department (OPIM), the Operations, Information and Decision Department (OID). This department offers more than just a new acronym. It seeks to rigorously blend computer-based data analytics and business management decision making, the latter which has become increasingly dependent on the former. ... "
" ... IBM says Watson represents a new era of computing — a step forward to cognitive computing, where apps and systems interact with humans via natural language and help us augment our own understanding of the world with big data insights. Here are eight examples of organizations using Watson Analytics to transform their operations. ... "
" ... It's no secret that Hadoop and Apache Spark are the hottest technologies in big data, but what's less often remarked upon is that they're both open-source. Mike Tuchen, a former Microsoft executive who is now CEO of big-data vendor Talend, thinks that's no coincidence. .... "We're seeing a changing of the guard," he said. "We expect the entire next-generation data platform will be open source." The platform he's referring to is an expanded Hadoop ecosystem, in which the whole stack is open source. "It's the new normal," he said. ... "
Robert Martin talks on the past and future of programming languages. Always thought we would be much closer to very visual and service oriented methods by now. Or even completely automated, robotically assembled systems. Google opines on micro moments. Where these confirmed during the past holidays?
" ... Micro-moments are transforming the way consumers shop. Retailers have to win micro-moments to win omni-channel shoppers. .... Google's VP of Marketing, Lisa Gevelber, shares three ways retailers can be moments-ready, using examples from those that have seen success. ... "
" ... after Etsy completed an IPO that valued it at $3.5 billion, the craft marketplace is expanding. The company is introducing Etsy Manufacturing, a new service that will link Etsy sellers — who often make items by hand — with small manufacturing companies. The operation is designed to help both sellers who've found success but have little time to fulfill larger orders, and smaller manufacturers, some of whom have lost business to huge manufacturers in countries where labor is cheaper. Starting Monday, manufacturers will be able to create a profile on Etsy, part of a beta program for the new service during which the company will collate their details. Sellers will eventually be able to search through these manufacturers by criteria such as price, location, and the manufacturing services they offer. Etsy will review the applications of manufacturers, checking up on their size, their commitment to transparency, and how much work they themselves outsource, but the marketplace won't actively visit or vet the successful applicants. Instead, it demands that manufacturers featured commit to providing a safe work space and are transparent about their manufacturing processes. ... "